This entry was posted on Monday, July 26th, 2010 at 11:26 am	and is filed under Loving Local Blogathon. You can follow any responses to this entry through the RSS 2.0 feed. You can leave a response, or trackback from your own site. That all sounds fabulous – if only I could come to visit you while it’s all happening!! This sounds fun. I would like to attend, but will be in Kentucky. I hope it is big, big, big! What a cool idea-have fun! Hi Tinky, I’ll pass this on and also plan on participating! Thanks!!! Great idea Tinky! Would love to participate but I’ll be on holiday. Good luck! Tinky, I want to participate. I used to have an old cookbook called “The American Heritage Cookbook” (oddly enough purchased in Ireland – go figure) in paperback. I loved it but somehow lost it in my many moves. So, I want to find another copy and then I hope come back and tell you what recipe I’ve chosen from that book. If I can’t find it I’ll find something somewhere else. What a great idea – and I don’t mind telling you a great idea for a blog post that I didn’t have to come up with! Frayed, EveryDay, and E., you may always participate long distance–although you don’t HAVE to! Abigail, enjoy your holiday. Kathleen and Grad, hooray for you! Can’t wait to see your posts……. I just found your blog and I love it! The recipes look delicious! 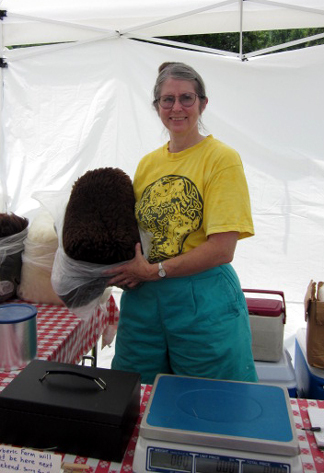 I joined on FB – and the commonweeder will blog too. 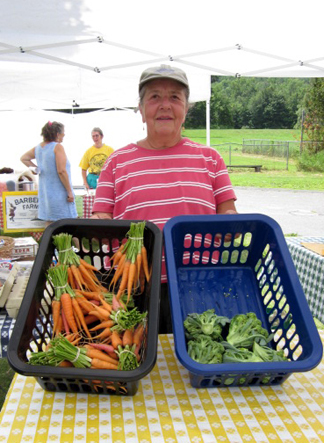 We love Farmer's Markets, and farm stands, and fresh food from our own gardens. The stringbeans are finally coming in. Thank you both. Commonweeder, I look forward to your post! 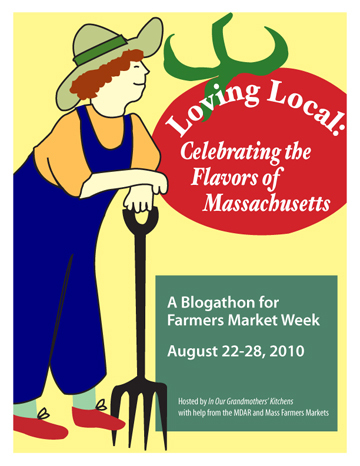 As a supporter of both the Lexington Farmers Market and the Mass Federation of Farmers Markets, I plan to blog on the events of the Lexington Market and whatever I'm cooking from the market during the week of the blogathon. What a great idea. I love Mass Farmers Markets!!!! I'd love to participate, but I'll have to post before August 22 since I am having a baby around August 20. You don't mind a slightly early post, do you? Yes, I’ll blog about this on New England Folklore. Please add me to the list! Thank, you, Sara and Peter. And Sara, I know what you mean about those turning leaves–a message for us all to get cracking on canning! Here is our blog post. Thank you for including us!! It looks wonderful, gals. Thanks for participating! Thanks for running the show and inviting me to be part of the blogathon!